Harvest of commodity crops is just starting in this neck of the woods. 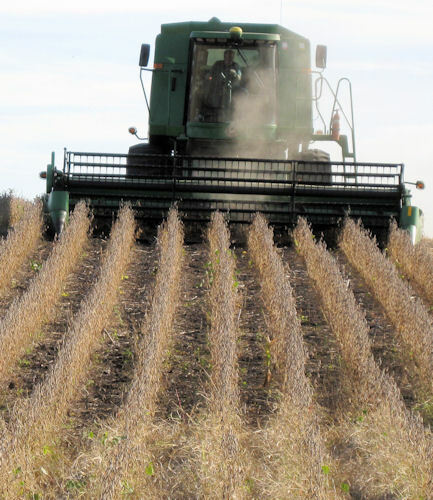 In the field adjacent to our farm, our neighbor starts on soybean harvest. 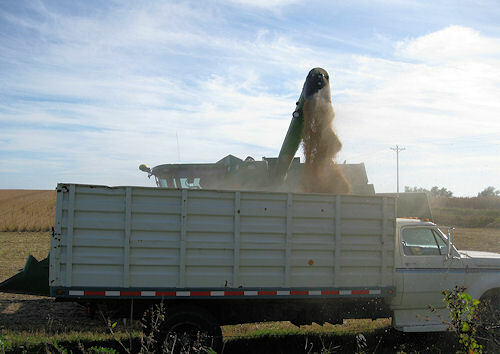 Soybeans have a shorter growing season than corn, and are usually harvested first. This scene will be repeated countless time the next month or so. 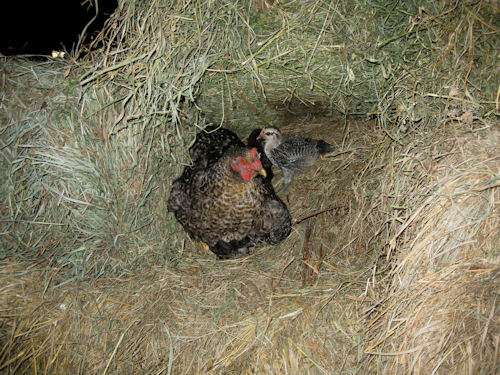 Mother hen found a new cavity in the hay – yesterday I picked up 50 bales of hay and haphazardly piled a few misshapen bales near the door and came back to properly stack them and found the mother hen and her seven chicks had adopted it as their home for the time being. In this photo, you can just see two of the chicks – one on top and one peeking out underneath her – the other five are huddled under the hen out of view. It’s time to send garlic to market. This is our first time selling to an organic grocery store. 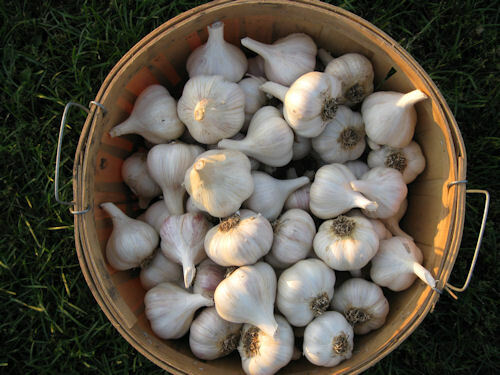 After saving back 20 pounds or so for seed, a few pounds for ourselves, we’ll add a 30 pounds to the central Iowa local garlic supply. We’ll do this again and maybe have a bit more next summer. We started on tomatoes about 2:30 and with GJ and Martin cutting up tomatoes for about 3 hours, we managed to put up 28 quarts of tomatoes today! 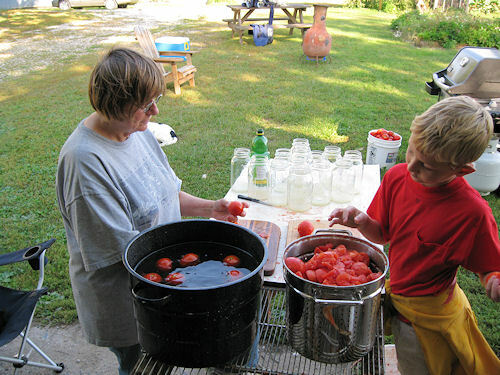 Tomatoes take a while as they need to process for 50 minutes, but there is nothing like the home-canned tomatoes. Martin had a long time to think while he was cutting up tomatoes and made a step-by-step analogy between the previous day’s chicken butchering and the tomatoes. Step Six – Put chicken parts in bags and freeze to preserve/put tomatoes in jars to preserve. It’s about time for a turkey update. After the skunk in the brooder house, we were left with 12 turkeys. One them had a badly damaged leg from the skunk and wasn’t moving around too well, so now that they are about big chicken size, we threw it in with the chicken butchering. 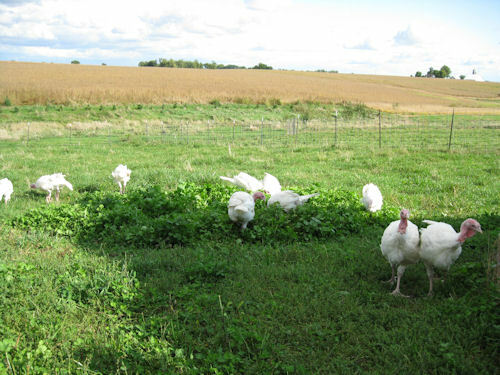 The rest of them are happily about, foraging and being turkeys, starting to gobble and puff up at any hint of danger. Back from my days at the county conservation board, I learned that turkeys don’t like owls, so if you make an owl hoot, the turkeys send out an alarm that spreads through the flock. Photo Friday is a weekly photo challenge that offers up a theme and people post photos about that theme. I’m an intermittent participant, depending on the theme and what’s going on at the farm. 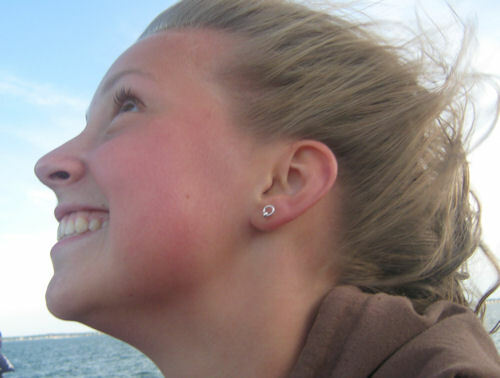 This week’s theme is “the face” and my entry this week is one of pure joy from Emma on a whale watching boat in the Atlantic. 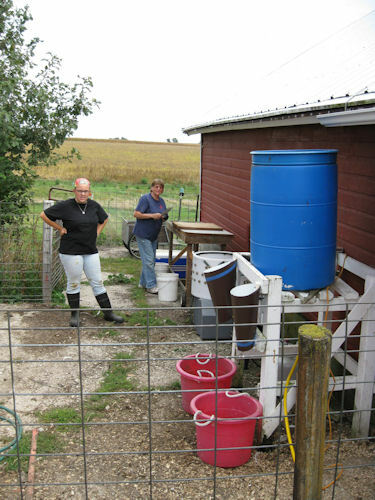 September 23, 2009 – Fall Field Screensaver! I took a few shots of the fall fields and even though I missed the golden yellow phase of this soybean field, it still looks like one of those screensavers you might get with a new pc – plenty of room for desktop icons! 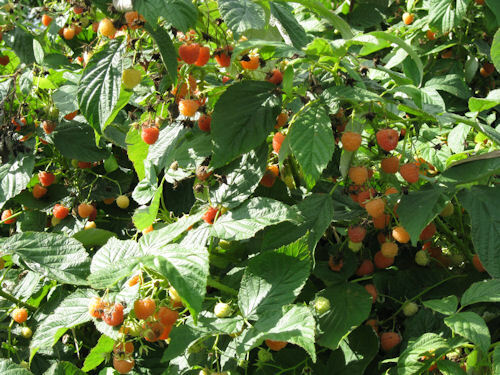 The golden raspberries are particularly prolific this year. We only have about 15 feet of row, but it’s more than we can use at the moment. The flavor isn’t quite as good (to my taste buds) as the red berries – not quite as strong as the reds. However, I think this winter we’ll make a “raspberry lovers” gift box with red raspberry jam, golden raspberry jam, and raspberry jelly. 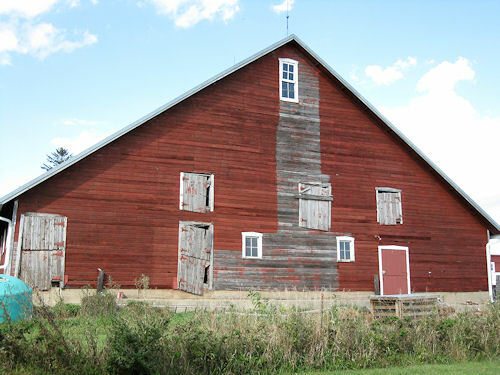 I know this is getting redundant, but it’s a big barn! Here’s the latest on staining the south side. I’ve started cutting out and painting some of the trim boards ahead of making new doors. It’s still going to be a while, but progress is apparent. Today was the day we’ve been anticipating for quite some time. Two years ago the closest locker that butchered chickens (about 25 miles away) stopped processing chickens. Last year, the next closest locker (about 80 miles away) stopped doing chickens. Rather than drive even further – twice – once to drop off and a day or so later to pick up, we decided to try to be more efficient and do it ourselves. Here’s the initial setup. I made some makeshift killing cones out of some aluminum flashing I had lying around. Hiding behind the cones is a 35 quart turkey fryer for a scalder, then the new featherman plucker, (we looked into making a homemade whizbang, but the price was 2/3 of a featherman so we went in with two other farmers to get this plucker). Next is the table for cutting up, finally some big coolers for chill tanks. We decided to take it easy and only do 20 birds the first time to test out our system. Linda working on cutting up a chicken. We are very pleased with the way the afternoon went. It probably took about an hour and half to do the 20 birds, not counting set-up and cleanup. It’s not often that something goes better and takes less time than you plan for, but that was the case today. I think the key was having great information. 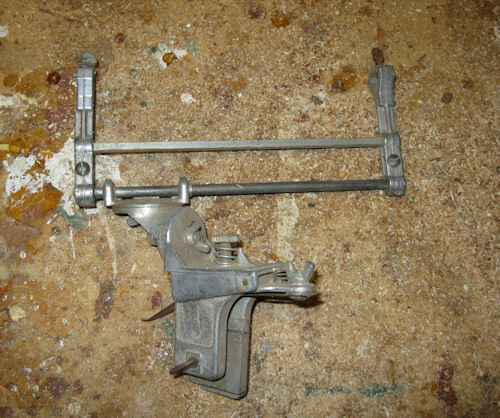 The featherman web site has a great couple of YouTubes showing how to butcher that were very helpful in addition to GJ from her butchering many decades ago. All in all, we are very pleased with the event and will have the rest to do in a while and then turkeys at Thanksgiving. Since this is, in theory, Claire’s last birthday at home, the girls decided to have a joint birthday party this year. 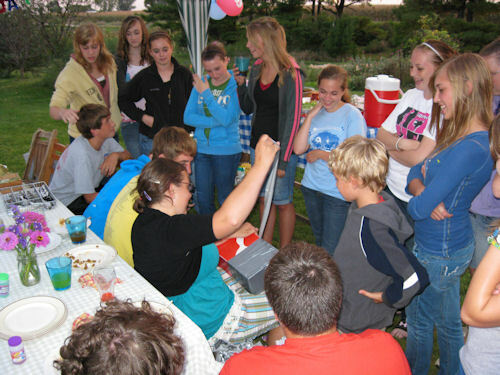 Their choice was to each invite 10 friends for an evening ofÂ fun like only high hopes gardens can provide. 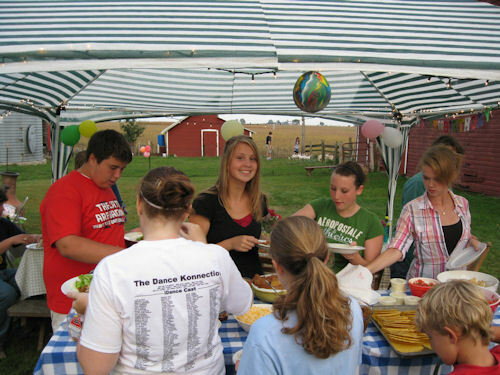 The night started out with a taco bar under the tent shelter, adorned with lights for atmosphere later in the night. Emma moves through the food line. One of Claire’s gifts was creatively wrapped – there was an exterior layer of tin foil and duct tape, a layer of birthday wrap, a layer of saran wrap, another layer of wrapping paper, followed by a final interior layer of duct tape! Claire also got a real experience as one gift. 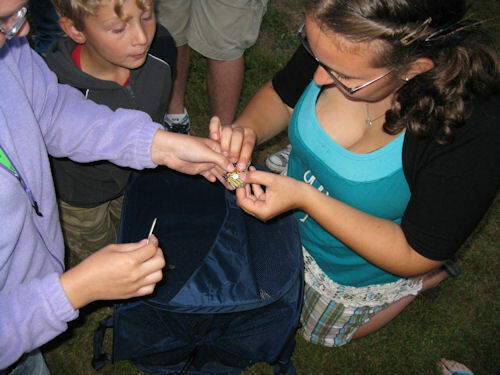 A friend brought some monarch butterflies and tagging materials and showed Claire how to tag Monarch butterflies and release them to fly to Mexico, where her friend had seen the overwintering place last winter. 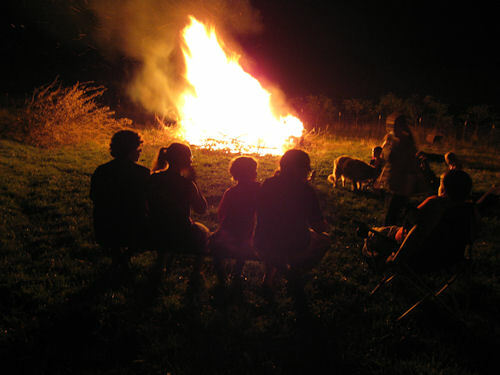 After some hearty games of capture the flag over the farmstead, it was time for a big bonfire. Happy 15th and 17th! In the August 13, 2009 issue of Scientific American, the magazine issues a strong editorial against the practice of biotech companies to NOT ALLOW independent research of the efficacy and safety of their products. Such statements are in stark contrast to the biotech industry that claims via many industry groups such statements as this one from the International Food Information Council ” A strong regulatory system is in place in the U.S., based on the broad consensus regarding safety among the scientific community.” Now read what read what independent crop scientists have to say about the “consensus regarding safety” of biotech crops. Advances in agricultural technology” including, but not limited to, the genetic modification of food crops” have made fields more productive than ever. Farmers grow more crops and feed more people using less land. They are able to use fewer pesticides and to reduce the amount of tilling that leads to erosion. 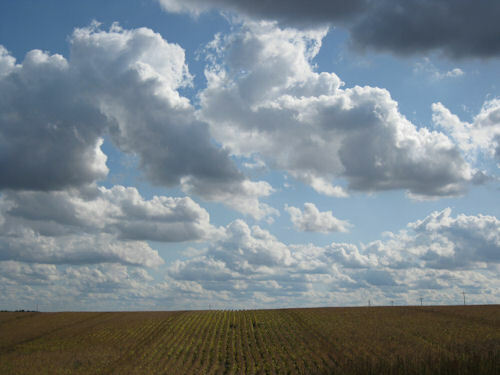 And within the next two years, agritech companies plan to introduce advanced crops that are designed to survive heat waves and droughts, resilient characteristics that will become increasingly important in a world marked by a changing climate. To purchase genetically modified seeds, a customer must sign an agreement that limits what can be done with them. (If you have installed software recently, you will recognize the concept of the end-user agreement.) Agreements are considered necessary to protect a company’s intellectual property, and they justifiably preclude the replication of the genetic enhancements that make the seeds unique. But agritech companies such as Monsanto, Pioneer and Syngenta go further. For a decade their user agreements have explicitly forbidden the use of the seeds for any independent research. Under the threat of litigation, scientists cannot test a seed to explore the different conditions under which it thrives or fails. They cannot compare seeds from one company against those from another company. And perhaps most important, they cannot examine whether the genetically modified crops lead to unintended environmental side effects. Research on genetically modified seeds is still published, of course. But only studies that the seed companies have approved ever see the light of a peer-reviewed journal. In a number of cases, experiments that had the implicit go-ahead from the seed company were later blocked from publication because the results were not flattering. It is important to understand that it is not always simply a matter of blanket denial of all research requests, which is bad enough, wrote Elson J. Shields, an entomologist at Cornell University, in a letter to an official at the Environmental Protection Agency (the body tasked with regulating the environmental consequences of genetically modified crops), but selective denials and permissions based on industry perceptions of how “friendly” or “hostile” a particular scientist may be toward [seed-enhancement] technology. Shields is the spokesperson for a group of 24 corn insect scientists that opposes these practices. Because the scientists rely on the cooperation of the companies for their research” they must, after all, gain access to the seeds for studies most have chosen to remain anonymous for fear of reprisals. The group has submitted a statement to the EPA protesting that as a result of restricted access, no truly independent research can be legally conducted on many critical questions regarding the technology. It would be chilling enough if any other type of company were able to prevent independent researchers from testing its wares and reporting what they find ”imagine car companies trying to quash head-to-head model comparisons done by Consumer Reports, for example. But when scientists are prevented from examining the raw ingredients in our nations food supply or from testing the plant material that covers a large portion of the country’s agricultural land, the restrictions on free inquiry become dangerous. Although we appreciate the need to protect the intellectual property rights that have spurred the investments into research and development that have led to agritech’s successes, we also believe food safety and environmental protection depend on making plant products available to regular scientific scrutiny. Agricultural technology companies should therefore immediately remove the restriction on research from their end-user agreements. Going forward, the EPA should also require, as a condition of approving the sale of new seeds, that independent researchers have unfettered access to all products currently on the market. The agricultural revolution is too important to keep locked behind closed doors. Here’s this week’s thingamajig Thursday. 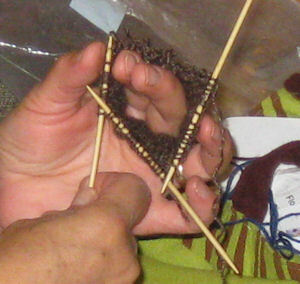 What’s Linda knitting?